As you probably know by now, we love public art, particularly the type that makes us think and give inspiration. The story goes, Candy Chang, a New Orleans artist and the founder of this movement lost someone she loved and went through a deep period of mourning. When she finally recovered, she still could not shake the idea that people take so much for granted and often forget what matters most to them, so she decided to make a monument to help her and the people around her remember every day. She decided to paint the side of an old house in her neighbourhood with chalk board paint and wrote “Before I die”, hoping that strangers passing by would come along and fill in the blanks. Of course by the following day the wall was full of heart-warming and sometimes funny stories, the idea grew viral and soon enough people were asking for permission to make their own “Before I Die” walls. 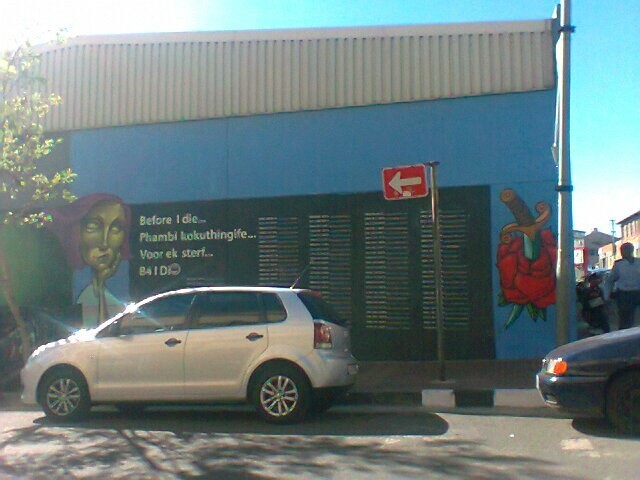 Over 500 have been made world-wide, including the one pictured above, in Johannesburg South Africa.